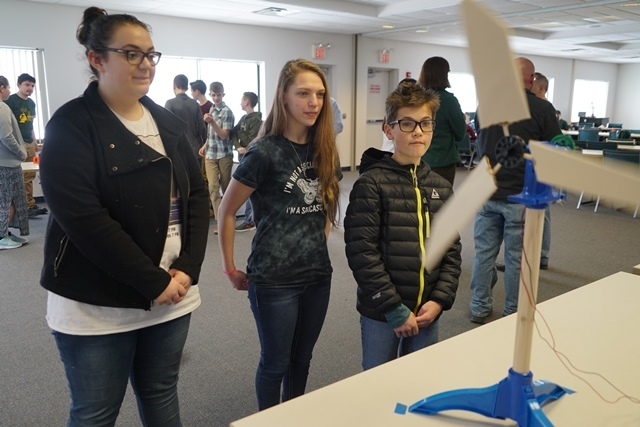 Lessons behind the science of renewable energy were the focus as students in grades 6-9 took the Wind Blade Challenge, an event hosted by Jefferson-Lewis BOCES at the Howard G. Sackett Technical Center on March 9, 2018 and sponsored by Avangrid Renewables. A total of thirty students from Lowville Academy, Copenhagen Central, South Lewis Central, and River Valley Mennonite School took part in the competition. The students were tasked with building the best homemade wind blades that would be tested against each other. One testing station determined how much voltage the blades were able to produce while the second measured how fast the blades were able to lift a weight. Both tests involved placing the blades in front of a moving fan set at a predetermined speed. 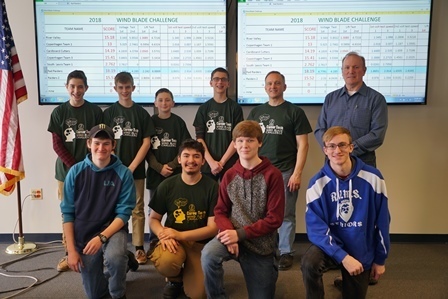 The competing teams were given two chances at each testing station, allowing them the opportunity to make improvements to their wind blades after the first series of tests and a chance to improve their final score. Each testing area was manned by students in the Engineering and Design program at the Sackett Technical Center. Once the testing was completed, the scores were compiled, giving the win to a team from Lowville Academy, made up of seventh graders Colin Kempney, David Fayle, Trevor Lawton and Landen Moshier. Their prizes for finishing first were drones while each participant left with the official 2018 Wind Blade Challenge t-shirt. All were donated by Avangrid Renewables. While it may have been a competition, fun was the main priority for many of the students. Daniel Costella, a seventh grader at Lowville Academy, was participating for the second straight year and took what he learned last year into designing his wind blades for this year’s event. A.J. Hood, an eighth grader at Copenhagen Central School, didn’t quite know what to expect when he entered the competition, but found the overall experience very rewarding. That was something apparently shared among the participating students as many raised their hands when asked if they would like to return for the 2019 Wind Blade Challenge.